Peter Cushing and Christopher Lee, masters of terror, in a Hammer horror classic. What is the terrible secert of the Village Vandorf? The village has known a succession of murders, and in each case the victim has turned to stone. The villagers decide that the young Bruno Heitz, whose lifeless body has been found hanging from a tree, was the evil genius behind the sequence of crimes. But then another victim is turned to stone. What does Prof. Namaroff (Cushing) know of the evil spirit in Castle Borski? Why does famous Prof. Meister (Lee) of Leipzig visit Vandorf at just this moment in time? During a night of incredible horror the terrible truth is revealed. � Hammer Film Productions/Columbia Pictures. 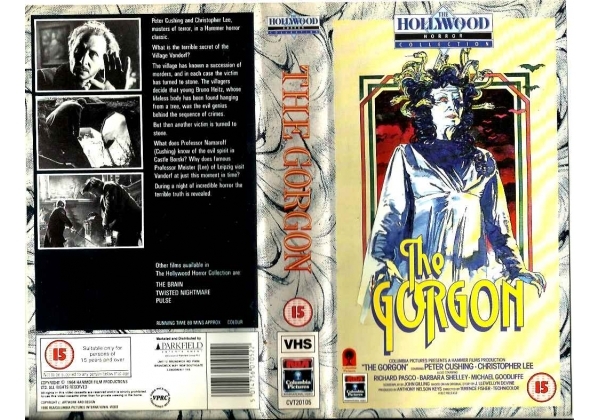 Or find "Gorgon, The" on VHS and DVD / BluRay at Amazon.